Though the "Godhead" crossover, the third in Robert Venditti and company's Green Lantern event trilogy, is not quite at the level of the second one, "Uprising," it's still plenty enjoyable. There's a lot of fun, if nothing else, in seeing the Green Lantern Corps match wits with the New 52 iterations of Jack Kirby's New Gods. Though only four parts of the twenty-something issue story are collected in Green Lantern Vol. 6: The Life Equation, most of the titles do well in making the crossover read in-series as well as book by book, such that reading this volume alone yields at least the semblance of a complete story. At twenty-something issues, "Godhead" is surely a tighter and more pleasurable read than the similar-sized Superman: Doomed crossover. In this book specifically, Venditti continues to explore well the aftermath of Geoff Johns's long work with Green Lantern Hal Jordan. Johns built Jordan back from limbo to DC's preeminent hero for a time, and from villain to leader of the Green Lantern Corps. But leadership hasn't come easily to Jordan, and here Venditti shows the culmination of that journey and what inevitably comes next. I had been skeptical of the looks of Green Lantern's post-Convergence direction, but with this volume Venditti convinces me to stick with the title. There's many different paths in "Godhead" that can, again, be read issue by issue, but the Green Lantern issues appropriately follow Hal Jordan in a tangent that peels him away from the Corps and much of "Godhead"'s main action. In this, of the four issues devoted to "Godhead" (three regular issues and an annual), the third feels a bit of waste (in which Jordan spars unnecessarily with Black Hand), but it's more than made up for by the strength of the other three. As has often been the case during this Green Lantern run, artist Billy Tan's dynamic art in the first and fourth chapters gives the story cinematic flair (especially in the conclusion, where Jordan catches a falling New Genesis! ), side by side with Venditti's strong character work. That character work equally shines in the last three issues of the collection, devoted respectively to Jordan's relationship with Star Sapphire Carol Ferris, to his leadership of the Corps and interaction with the Templar Guardians, and to his friendship with Kilowog and what comes next for Jordan. The Guardians finally acknowledge Jordan as not only a successful Corps leader, but the de facto greatest of the Green Lanterns; almost in the same breath, however, they plant the seed of Jordan pretending to betray the Corps and go into exile to help restore the Corps's tarnished reputation. It is, as we might imagine Carol would say, indicative of a pattern of Jordan torpedoing his life just as things get good, but we also see Jordan, having turned bureaucrat in the pinnacle of his career, suddenly returning to the high-flying, risk-taking Hal Jordan at the core of the character. Venditti's Green Lantern has been and continues to be faithful to Johns's run that preceded it. We see, for instance, Jordan and Sinestro referencing the significant question one wanted to ask the other throughout Johns's run, and indeed Venditti writes a great, complicated multi-page conversation between the former friends. Also the First Lantern and Krona from the culmination of Johns's run play a significant role. At the same time, given the excruciating sequence in Johns's story where Jordan refuses to let Black Hand resurrect Jordan's late father, it seemed blithe that Vendetti has Black Hand do so here without much fanfare. Also -- a complaint more about "Godhead" in general than Venditti's parts -- I was disappointed no tie was made between Orion's actions here and his role in Brian Azzarello's Wonder Woman, though Darkseid's attack in Justice League Vol. 1: Origin is mentioned. Also, throughout the runs of Venditti on Green Lantern and Justin Jordan on Green Lantern: New Guardians, the sudden relationship between White Lantern Kyle Rayner and Carol has been problematic, coming only an issue after Carol broke up with Hal Jordan. Carol is treated not much less like a romantic football in this book, including Jordan granting his permission to Kyle for he and Carol to date. Venditti's issue in which Jordan makes a bar trip gone awry with Guy Gardner and Barry Allen, both of whom drown him in their own sorrows, is funny, but there's equally no great resolution when Carol arrives on the scene (I still hope New Guardians reveals some sort of secondary influence involved, even as that comes with its own set of problems). But in all there is a lot of energy in Green Lantern Vol. 6: The Life Equation, and it's another of Venditti's Green Lantern volumes that thankfully deals with the characters as superheroes and space cops without bogging down in the minutia of Green Lantern lore. 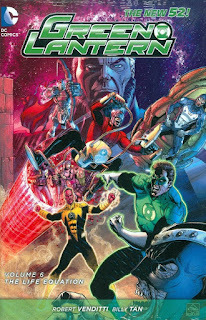 Again, it's a crossover where the characters' actions make sense and where the different storylines are interspersed enough that no book feels totally on its own, even as this at least can be read that way (lacking is the New Gods: Godhead issue, which ought have been included here if not in all the Green Lantern crossover collections). Coming up, Robert Venditti writes a Green Lantern who's not actually a ring-bearer (and with an awfully 1990s-inspired costume), but I've got a lot of faith in Venditti and Billy Tan to pull it off. I'm so surprised that I was able to read this before your review O.O I'm so happy :3 Anywho, I agree with everything you said. It wasn't as big and tight nit as volume 5, but it was still good. Also that "giant" Hal Jordan scene at the end was awesome. The one thing I am looking forward to the most is volume 7 since that will be Venditti's first GL storyline that isn't tied to other books, so I'm very curious how much more freedom and linear his story will be. Also, I'd like to post a question. At the end of this volume Saint Walker get his hope back and once again dons the Blue, and at the end of John's run when he's going through the character's lives after the fact it shows that the blue lanterns will one day rival the green lantern in numbers. When do you think we'll see more blue lanterns coming into the mix? Unfortunately, I'd have to say "never" on the Blue Lanterns, or otherwise when Venditti decides he wants to do it; Johns establishes it, but I'd venture Venditti is under no obligation to make it happen. Different writers, different runs. That said, you caught the end of Red Lanterns? I have not, only what's out for GL and GLC. Still have to collect the other titles like New Guardians (which I'm most excited to get to), Red Lanterns, and Sinestro. Among what you listed, Red Lanterns is far and way my favorite.